Reflecting the multicultural makeup of Toronto there were several different ethnic groups marching in the St Patrick's Day parade. 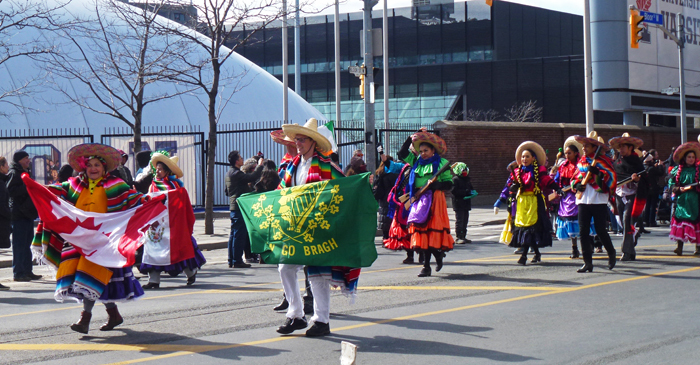 This Mexican group was one of the more colourful ones! Wonderful to see that multiculturalism can work! And in so many ways, too. Not celebrated at all over here, maybe in the two Irish pubs we have. This is great, Pat! I'm wondering if we could build a wall around the White House and keep the orange-headed monster inside where he could cause less trouble? THAT is a melting pot! Hello, looks like an awesome parade. I am sure we have some Mexican-Irish people in our country. Happy Thursday, enjoy your day! I love their traditional dress! What a treat! We use to go to the St. Patrick's Day parade in San Antonio, TX where a majority of marchers have at least some Hispanic ancestry. It was always a great event. Seeing this is not as unusual as you might think. Multi culture should be celebrated as often as possible, it's what makes cities thrive. Super shot Pat. Que bonito esta união dos povos, em uma mesma celebração. O México apresenta-se sempre com muitas cores alegres e bem harmonizadas. A Mexican leprechaun! How much fun is that! It doesn't get any better with a multi-cultural parade. Great colours and a wonderful parade enjoyed by all. They are always the most colorful. Viva Mexico! Your parade is very different from the ones I have seen. In Hartford or Naples, there are Mexicans, but they are dressed up in green, not their own native costumes. Absolutely, and we all enjoy the fun of it all!